Each year, Ohio’s most pristine natural areas are better protected thanks to donations to Ohio’s Natural Areas Tax Checkoff Program. These donations directly and immediately help the Division of NaturalAreas and Preserves (DNAP) manage a system of 136 nature preserves, totaling 30,000 acres, across the state. These important natural areas - which include prairie landscapes, forested wilderness, deep valleys, high hills, gorges, natural bridges, waterfalls, and winding streams –are protected in perpetuity and managed for the rare species and habitats that occur within them. Visitors are invited to explore many of these preserves, which are open daily from dawn to dusk, and activities such as bird watching, hiking, nature study and wildlife photography are highly encouraged. State Nature Preserves are sanctuaries for rare plants and animals - 40% of Ohio’s endangered species, and 58% of Ohio’s threatened species, are represented and protected within them. As taxpayers, Ohioan’s should take pride in protecting these magnificent natural areas for conservation, recreation, and enjoyment for generations to come. The majority of the Division’s funding for “on the ground”conservation action comes from the Natural Areas Tax Checkoff Program. This money is used specifically for new land purchases, facility upkeep, ecological management and research, and educational activities for all ages throughout the year. Since its inception more than 30 years ago, the tax checkoff program has received widespread public support. Over two million donations have been made, providing over $16 million for natural land conservation and management. Yet many native plants and animals are threatened with elimination from Ohio. High quality natural areas are being lost faster than they are being saved. The Natural Areas Tax Checkoff Program provides a convenient and efficient way for all Ohioans to support nature conservation. Ohioans can donate all or part of their state income tax refund by checking “Natural areas”on line 26c of the 1040 Individual Income Tax Return. Contributions made on the 2015 tax return, filed in 2016, are considered deductible charitable donations made in 2016. 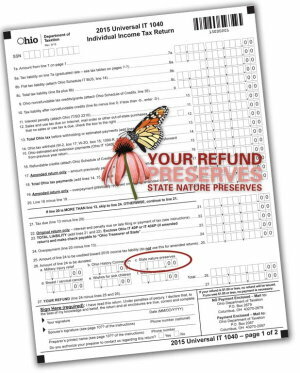 As tax season approaches, we hope that you will remember the Division of Natural Areas and Preserves when filing your state income tax return – and join us in protecting Ohio’s natural treasures, forever.